This film was based on the magnificent Tchaikovsky ballet, which was in turn inspired by E.T.A. Hoffmann’s fantasy story, “The Nutcracker and the Mouse King.” What this film does it try to combine the two mediums—a gorgeous dance movement with a beautiful set design with hardly any plot, and a story full of fleshed out characters and adventure—to create something that is simultaneously both and neither. First-time writer Ashleigh Powell crafts the film’s story and plot to fit the children’s film mold, which leaves it feeling a lot less original and a lot more like one of those forgettable straight to home video sequels they released decades ago. Everything is straightforward with only one “major” twist you already know is coming. The motivations are vague and often verge on the comically nonsensical. Most characters can’t even get a coat of character development painted on them, just becoming pretty set pieces that we revisit when we need a shoddy line of exposition thrown in the mix to keep up from confused. 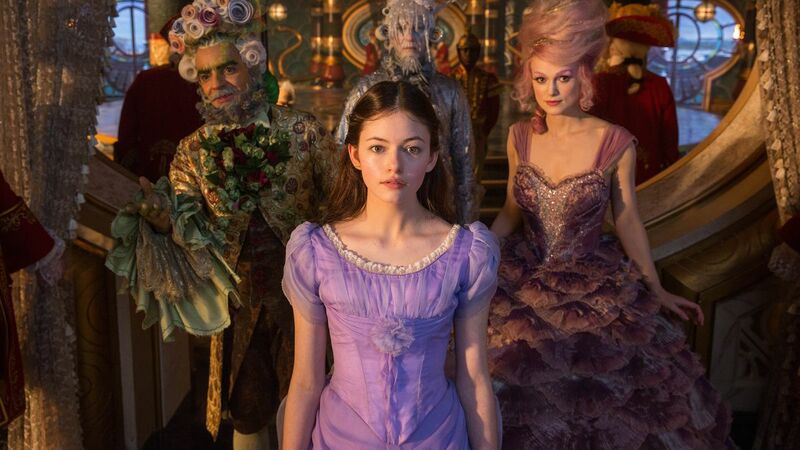 The only character who is actually treated like a person is Clara (Mackenzie Foy), our guide into this world. Clara is shown as strong and smart, but an emotional mess. To make sure that the audience understands just how unconventional Clara is, they make sure to emphasize her tomboy aesthetic, like the masculine quality of her clothes and her unkempt hair. Her motivation throughout the entire film is to figure out what she’s missing in her life, with the obvious realization later being that she’s had it all along. In the end, I do love the message, no matter how many times I see it in films meant for children. It’s a strong message that bears repeating, but for once I’d like to see them change it up by having it delivered by a boy who is in touch with his feminine side. The film also does a good job of reminding us that judging people and things based on appearances is wrong. Sometimes, things that appear sweet are actually sour, and vice versa.